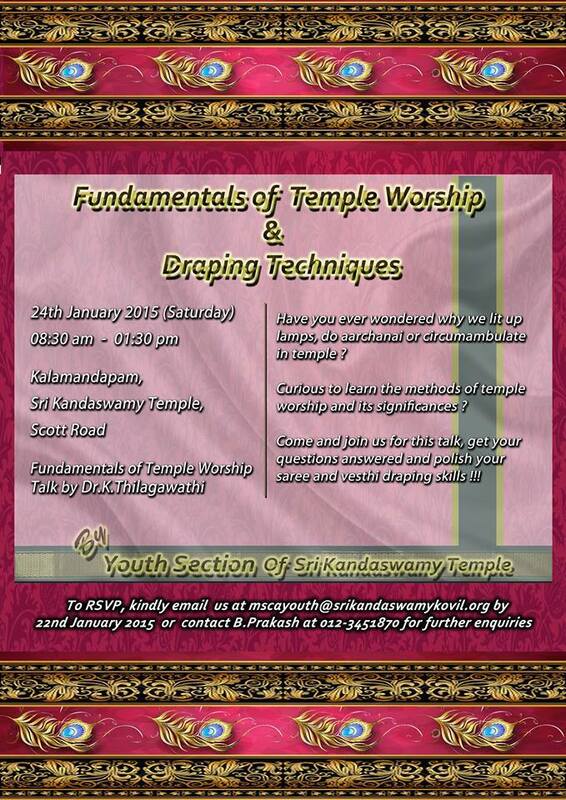 The Youth Section of Sri Kandaswamy Temple, Brickfields will be organizing a talk on Fundamentals of Temple Worship and Draping Techniques that will be held at Kalamandapam, Lorong Scott. Dr. K. Thilagawathi who is currently serving as a president at Malaysia Arulneri Thirukkoottam, K.Lumpur and as a member of the Religious Advisory Board of Malaysia Hindu Sangam and as a vice-president at Sri Kandaswamy Temple, Kuala Lumpur will present the talk. Light refreshments will be served. Admission is free. The talk is opened to all aged 13 and above. Those interested in attending this talk please complete the registration form.